Pressing the button changes the display as follows. Displays the total distance the vehicle has been driven. Displays the distance the vehicle has been driven since the meter was last reset. Trip meters A and B can be used to record and display different distances independently. Press and hold the button to reset. Displays the outside air temperature. Displays the average fuel consumption since the function was last reset. • To reset the function, press and hold the button while average fuel consumption is being displayed. 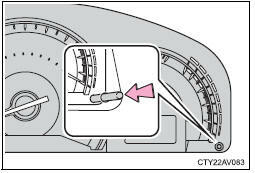 The average fuel consumption meter will also be reset, returning the needle to the 0 position.